I probably made like 10 different versions of the hand, before settling for this one. I'm still not 100% satisfied, but I'll give it some rest for now, to possibly rework it later on. Here I tried emulating those old-school kind of terrible looking wallpapers, with a tile at the bottom to make it resemble a wall. When it came to this icon, I tried a couple of different things, showing the chair both as a silhouette and in its rendered form. In the end, I think this looked a bit better, so I went with it! I chose a bookcase for this one since it's a type of furniture that's easy to recognize, even in a very small icon. 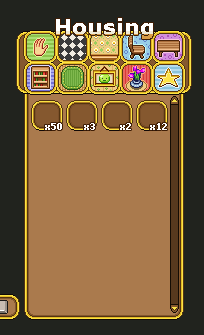 Here I simply made an icon version of one of the 'classic' carpets of the game (that is, one that you'll run into quite a few times when you visit houses in Grindea). For this category I chose to do a painting hanging on a wall slightly resembling the one from the wallpaper category. I thought a slime would be a nice motif, as it's one of those shapes you tend to see a lot in the game. Here I thought a simple star might be best, as it's a category that's really all over the place in terms of what items you'll find here!